Loretta Ruth Sailors (Ayling) left this world to paint the skies in the late hours of Saturday, Oct.13, at her home surrounded by her loving family. Loretta was born in Adrian, MI in 1924 to Alfred A Ayling and Elsie M Ayling (Sanford). She graduated from Adrian High School, attended Sienna Heights College and studied art at Michigan State University, from which she earned a bachelor's degree in 1946. While at Michigan State she joined Gamma Phi Beta Sorority. She taught at Grand Rapids Public Schools for 23 years. Loretta was a renowned artist, known for her colorful and ethereal watercolor paintings. 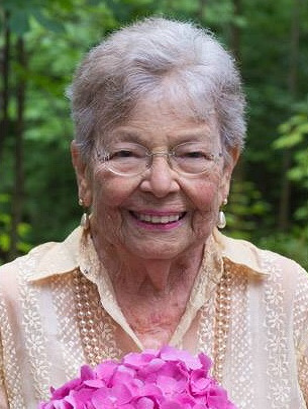 For nearly 30 years she taught adults watercolor classes out of her home and gained a loyal following of students whom she mentored and adored. Many local artists attest to Loretta's innate ability to find and nurture the talent in others, and in-part credit her mentorship and friendship in finding commercial and creative success. Loretta was known to others by her signature trait: joy. To Loretta, no occurrence or task was undeserving of joy, whether it be eating breakfast with her darling husband, Jim, examining the nuances in a bouquet of flowers or watching her great-grandchildren play at her feet. Among her favorite pass times was helping coach MSU basketball, football or The Detroit Tigers with the same (but much louder) exuberance she had for the beauty of autumn leaves or the first view of Lake Michigan every June. Loretta will be remembered as an eternally loving wife, mother, grandmother and great-grandmother who infused her family's life with profound happiness. She is survived by her daughter, Melissa Wild; son, William Sailors (Oni Razon); grandchildren, Hillary Wild, Melanie Kruisenga (Kyle Osipoff), PJ Sailors (Christie Sailors), Elyse Wild (Gideon Baker) Spencer Wild (Kaitlyn Chiazza); great-grandchildren, Jacob Osipoff, River Sailors, August Sailors and Kingsley Osipoff; sister Ellen Steudle (Chaz King), sister-in-law Beverly Bartlett and countless students and friends that adore her. A special thanks to Carol from Visiting Angels, Donna, Marianne, and Celine from Hospice of West Michigan. She is preceded in death by her parents; brother, Raymond Ayling; daughter, Heather Sailors; and loving husband, James Sailors just 18 days prior to her passing. There will be a Memorial Service at 1:00 p.m. on Monday December 3, 2018 at Westminster Presbyterian Church, 47 Jefferson SE. Following the service we will celebrate Loretta's life and art with a luncheon at Cherie Inn, 969 Cherry st SE. In lieu of flowers, consider donations to your local underfunded art teacher or school, WMSOS, or Mental Health Foundation of West Michigan.